"University of Minnesota Falls Short on Gender Neutral Restrooms"
"University of Minnesota Gender Neutral Restrooms Update 1"
It appears the correct contact for restroom gendering at the University of Minnesota is facilities management, according to emails from the Department of Environmental Health and Public Safety. The Transgender Commission's email is much more hopeful, although that will likely just concern the Ecology Building. I've inquired as to whether or not their is a policy on the issue. If not that is potential grounds for improvement and to stop all the silly back-and-forthing that seems to be the case here for this issue. This is not okay. 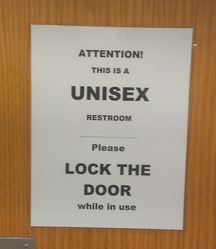 It seems to be suggesting that a unisex restroom could not ever be multi-use. Having used multi-use gender neutral restroom facilities at universities in the past, that is certainly not true. I was not able to go in at the time as someone had locked the multi-use restroom to use it, so I'm not sure if there are floor-to-ceiling stalls or what. It is also problematic that when one looks at the gender neutral bathroom list, a number of them are under a variety of restrictions, or suggest they are not open to the public (for example being labelled "Staff Restroom"). There really needs to be a clean-up of this system. The Vice President of Student Affairs at Purdue, Dr. Exum, once noted that asking the right questions can get a fair amount done. This proved true for me during my last two years at Purdue. Earlier I noted a post entitled "University of Minnesota Falls Short on Gender Neutral Restrooms," and I've decided this falling short is important enough for me to start asking questions. At Purdue, the correct contact concerning the gendering of single use restrooms on academic campus is in the Department of Environmental Health and Safety (in the residence halls it is the Director of Residence Life for those Purdue students who may be checking this out). I have started there with asking my question, which simply asks if there is a reason for so many single use restrooms to be gendered (and pointed out the Ecology Building as an example of this). I emailed the Department of Environmental Health and Safety a week ago and have not yet heard back, and thus have emailed them again today. I also emailed the Transgender Commission to ask the question two days ago, and so far have just gotten an auto-response letting me know the email is only checked once or twice a month. If I don't hear back in another week I will email an administrator who was hired here from Purdue. I will continue to update my progress on this issue here for those who are interested. Update: The email I sent to environmental health and safety department has been forwarded from the general email to a Specialist for Food, Water, and Housing. 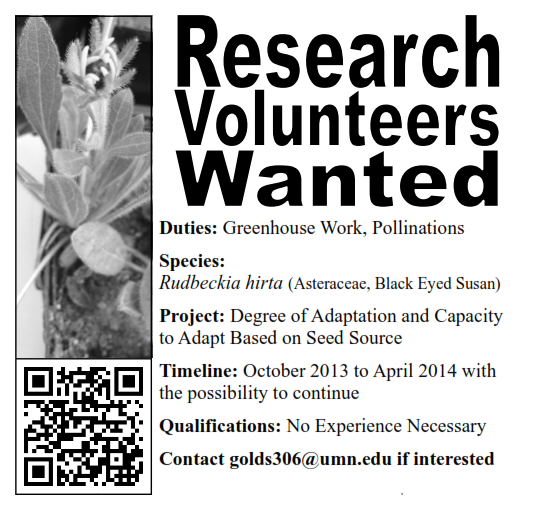 If you are or know of an undergraduate at the University of Minnesota looking for research experience involving plants, evolutionary biology, or quantitative genetics, please contact me or pass on my information. I've made a webpage describing the opportunities, and am willing to sit down with people to discuss the opportunities. Committment will vary, and thus we should discuss it. Plants will need to go into the greenhouse in October (so there will be planting and censusing germination). We will have to keep an eye on the plants and when they begin to flower crosses will begin! 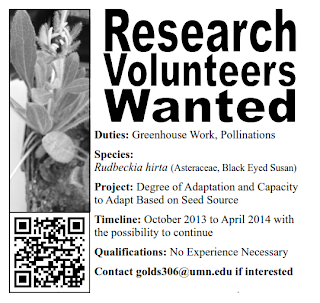 Plants will be hand pollinated. There will be some indirect data to come out of this (how long they take to germinate, self-incompatibility), and the potential to collect more (size, number of heads, etc. ), which could be analyzed by an undergraduate (potentially with my help). Plants represent populations from four different locations across Minnesota, so undergraduate mini-projects comparing the sites wouldn't be hard to set up, and self-incompatibility data will likely come as a nuissance to the crossing design anyway.There are also a number of papers I would like to discuss with anybody who joins on, and there is the potential to continue working on the project after this academic year if desired. No experience is necessary, this is easily a starter experience for undergrads. I currently do not have money to take on undergrads, but there is the possibility of credit. Please visit this webpage for more information. Also, for a more fun, two-minute description of the project, check out this post.